The 31st Annual Lambda Literary Award finalists (“Lammys”) have been announced. The awards celebrate achievement in lesbian, gay, bisexual, and transgender (LGBT) writing. Winners will be announced at a ceremony on June 3. This year’s finalist were selected by a panel of more than 60 literary professionals from over 1,000 book submissions by over 300 publishers. The categories with nominees of genre interest are reported below. The full list of 24 categories is here. Congratulations to Lammy winners Carmen Maria Machado (Lesbian Fiction), Bogi Takács (Transgender Fiction), Emil Ferris (LGBTQ Graphic Novels), and Annalee Newitz (LGBTQ SF/F/Horror). 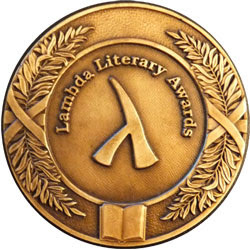 The awards were presented the 30th Annual Lambda Literary Award ceremony on June 4. The Lammys celebrate achievement in lesbian, gay, bisexual, and transgender (LGBT) writing. The winners in categories which had nominees of genre interest are reported below. The full list of 23 category winners is available on Twitter. The 30th Annual Lambda Literary Award finalists (“Lammys”) have been announced. The awards celebrate achievement in lesbian, gay, bisexual, and transgender (LGBT) writing. Winners will be announced at a ceremony on June 4. The categories with nominees of genre interest are reported below. The full list of 23 categories is here. The winners of the 29th Annual Lambda Literary Awards (“Lammys”) were announced on June 12. The awards celebrate achievement in lesbian, gay, bisexual, and transgender (LGBT) writing. There was one category with a winner of genre interest. The full list is here. The nominees for the 29th Annual Lambda Literary Awards (“Lammys”) have been announced. The awards celebrate achievement in lesbian, gay, bisexual, and transgender (LGBT) writing. Winners will be announced at a ceremony on June 12. The categories with nominees of genre interest are reported below. The full list is here. The winners of the 2016 Lambda Literary Awards (“Lammys”) were announced June 6 at a ceremony in New York. The awards celebrate achievement in lesbian, gay, bisexual, and transgender (LGBT) writing. The winners of genre interest are reported below. The full list is here. The nominees for the 28th Annual Lambda Literary Awards (“Lammys”) have been announced. The awards celebrate achievement in lesbian, gay, bisexual, and transgender (LGBT) writing. Winners will be revealed on June 6. The categories with nominees of genre interest (at least, the ones I recognized) are reported below. The full list is here. Finalists for the Lambda Literary Awards were announced March 4. Now in their 27th year, the awards celebrate achievement in lesbian, gay, bisexual, and transgender (LGBT) writing for books published in 2014. Winners will be announced June 1.